To be an investor is to be a decision-maker. Buy or sell. Take action or do nothing. Invest in Stock A or Stock B. The frequency and weight of the decisions can be overwhelming at times -- particularly if you're investing other people's money or recommending stocks for people to buy or sell -- but even as an individual investor, you're still making decisions every day about your portfolio, whether they're explicit or implicit in nature. As a friend of mine likes to say, "Any day you aren't selling a stock you own, you're buying it." His point is, even if you aren't actually buying more of the stock each day, the very act of holding implies you remain confident in the investment's prospects. Though you're taking no action, you are deciding there's more upside. Over the longer-term, our investment performance reflects the wisdom (or folly) of our decisions, so it's critical to be aware of the decisions we must make. If I were starting over, would I buy this stock at this price today? Am I holding onto this stock for the wrong reason (e.g. emotional attachment, etc.)? What do I know about this company that other investors don't? Asking these types of active questions is particularly important for long-term investors like us because we're prone to errors of omission -- that is, failing to take action when action is prudent. There's great value in being patient, of course, but there's a fine line between patience and laziness that's important not to cross. By actively considering your investments -- even if the decision is to do nothing -- it reduces the risk of being lulled into holding onto an overvalued stock or onto a business with a deteriorating competitive position. I recently finished reading David Einhorn's Fooling Some of the People All of the Time, which is primarily focused on his hedge fund's (Greenlight Capital) take down of Allied Capital. The Allied Capital case study is a must-read in itself, as it not only lays out Allied Capital's shenanigans in great detail, but also exposes the "system" that cushions corporate executives and the failures of the media, regulators, and investing community to wake up to what was going on. My favorite part of the book, however, were the first few chapters where Einhorn talked about his approach to investing. Here are some of my top lessons from those chapters. (On evaluating investments) First, what are the true economics of the business? Second, how do the economics compare to the reported earnings? Third, how are the interests of the decision makers aligned with the investors? One thing I've picked up over the years is that many of my favorite investors (Buffett, Akre, Lynch, etc.) spend a substantial amount of their research time on understanding management -- can they be trusted, are they good capital allocators, will they sacrifice the short term for the long-term, etc. You should do the same. Einhorn's third point also reminds me of Charlie Munger's insistence of understanding incentives. To do this for yourself, have a look at a company's most recent proxy filing or remuneration report and ask yourself if the board has established reasonable incentive metrics for management. In order to invest, we need to understand why the opportunity exists and believe we have a sizable analytical advantage over the person on the other side of the trade...It would be foolish to assume that our counterparty is uninformed or unsophisticated. What's your advantage over the person on the other side of the trade? For most individual investors, our most common advantage is our ability to think long-term and buy when others are selling for an emotional reason. Information advantages are possible, but they're not easy to come by in a relatively efficient market. The key either way is to identify why you think you have an advantage before you invest. Greenlight believes the traditional investment horizon is too short because equities are long, if not indefinite-duration, assets...If the downside of an opportunity is no short-term return or “dead money,” we can live with that. We are happy to hold for more than a year before succeeding. The trick is to avoid losers. Losers are terrible because it takes a success to offset them just to get back to even. (On shorting) It is psychologically challenging to manage a portfolio that outperforms only in a falling market. I have no desire to spend my life hoping for a market crash. We avoid “evolving hypotheses.” If our investment rationale proves false, we exit the position rather than create a new justification to hold. We consider ourselves to be “absolute-return” investors and do not compare our results to long-only indices. In assessing an investment opportunity, a relative-return investor asks, "Will this investment outperform my benchmark?" In contrast, an absolute-return investor asks, "Does the reward of this investment outweigh the risk?" This leads to a completely different analytical framework. Instead of trying to "beat the market" with each investment, focus on whether or not the potential returns outweigh the risk. Do this consistently over time and the relative market outperformance will come anyway. Given the different frameworks, comparing the results of an absolute-return strategy to a long-only benchmark is almost meaningless. It is almost like observing that the Dallas Cowboys (football) have a better winning percentage than the New York Yankees (baseball). I decided to run a concentrated portfolio...It is hard to find long ideas that are ones and twos or shorts that are nines and tens, so when we find them, it is important to invest enough to be rewarded. For an investor like Einhorn who does this full-time and has decades of experience, concentrating his portfolio in a few names works. For individual investors with less experience or who might only research their investments on the weekend, concentrating your portfolio can be more complicated. It's important to understand your emotional response to a concentrated position -- that is, can you stay patient and focused while a 20% position in your portfolio has short-term ups and downs? Personally, I couldn't comfortably hold a 20% position, but I could afford to invest more in my top ideas. Of course, making a mistake on an actual investment is far direr than missing a good opportunity. There are two types of bad outcomes. Sometimes, after analyzing the risk and reward, an investment appears attractive, but the unfortunate or unlikely happens. Such is life. Other times, the analysis is simply flawed: the investment is poor and we deserve the eventual loss. It's important to know when investment outcomes -- both good and bad -- are a result of "luck" versus "skill" (or lackthereof). Sometimes a well-researched idea simply doesn't work out and you shouldn't beat yourself up over those. That's just bad luck. Other times, your investment underperforms due to a poor research process. Those are the outcomes that you need to avoid as they're due to incompetence rather than bad luck. Over the years, we have found that carefully selected spin-offs are terrific opportunities. Market extremes occur when it becomes too expensive in the short-term to hold for the long-term. But, sooner or later, the truth wins. If you know you are right, all you need is patience, persistence, and discipline to stay the course. It occurred to me that people who are willing to lie about small things have no problem lying about big things. This lesson sounded familiar to me and then I remembered why -- a similar lesson can be found in the New Testament (Luke 16:10). It's a good lesson for evaluating character -- both of management and of people in general. In this low interest rate era, the demand for current income remains strong -- particularly among those living on a fixed income. Indeed, sales of immediate annuities recently hit a record, even though the buyers are effectively locking in low rates for the life of the contract. At first glance, it might seem a reasonable approach -- simply buy a few stocks with yields that meet your target yield, and then sit back and watch the cash flow in. As Woodford noted in the aforementioned quote, however, it’s never a good idea to start with an income target - especially a high one - and work backward as it can open up a number of longer-term risks. 1. Increased sector concentration: To achieve such a high yield right now, you'd need to anchor the portfolio in investments like royalty trusts, energy MLPs, and REITs -- and speculative ones at that. The market’s higher-yielding stocks are typically clustered in a few slower-growth (e.g. utilities), troubled, or speculative sectors. For example, such a strategy would have put you into a lot of bank stocks pre-financial crisis. If one thing goes wrong in the sector, your portfolio could be wiped out. 2. Increased risk: At present, the average yield on the S&P 500 is about 2%. When a stock is yielding more than 2x this average - particularly in a period of strong demand for dividend stocks - the market isn't likely pricing in much growth. 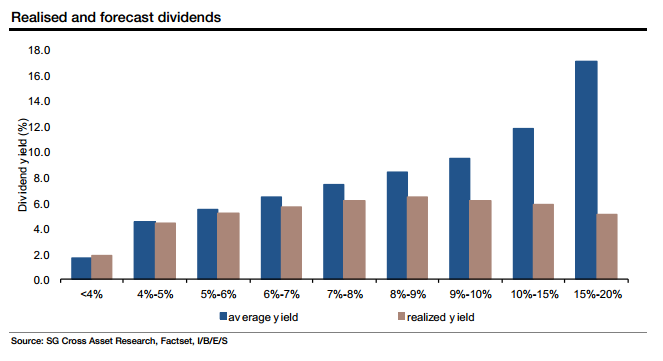 For ultra-high yields, the market might even price in a dividend cut. 3. Skews your selection process: When you've set an absolute dividend yield target that's far above the market average, you're no longer focused on doing thorough research and building a portfolio of good (and well-bought) companies that can sustain and raise their payouts over time. Instead, your sole focus is on dividend yield and the other important factors are rationalized away. A better alternative to setting a high and absolute yield target is to set up a relative one like, "at least 25% above the market average." In addition, establish a target dividend growth rate such as, "grow annual income more than 3 percentage points above inflation." That way you aren't fighting the market while getting above average income, you'll find more quality companies to consider, and you can maintain a longer-term focus (i.e. balancing current and future income).